Law firms have work to do to keep up with market shifts in the post-Lehman world. Here, leading legal industry figures chart the progress so far at a debate organised by Graham Gill. The following article is re-posted from legalbusiness.co.uk. Graham Gill is now part of Signium United Kingdom. In December, recruitment consultants Graham Gill hosted the latest in its series of breakfast round tables, which bring together a roster of heavyweight figures from in-house and private practice to discuss the future of the legal profession. 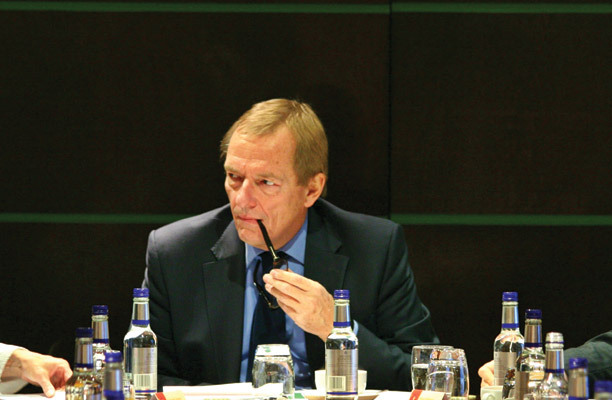 Chairing the debate Stephen Williams, the former general counsel of Unilever, recalled a previous discussion in the wake of the 2008 banking crisis, which looked at whether the partnership model was facing an existential threat. Williams recalls some (including himself) anticipating a bleak future – and being proved wrong in that prediction. This session looked at where the market is headed, having weathered the worst of the crisis. Stephen Williams: The shoe that threatened to drop after the crash of 2008/09 for the legal profession has taken quite a long time to come off. Have we used this time well? I would say we have used it patchily. Law firms have all adopted similar responses, aping some of the responses of their clients. The lawyer is used to having a narrow point of entry, based on the purely legal need. I suspect that many clients are drawn to the idea of quasi-legal questions being answered by other professionals. Sir Nigel Knowles: Clients are probably thinking that they can keep more in-house because it is cost-effective. What they want to keep in-house is what we would love to do, and they want to get rid of more of what Karl wants to do, which we do not want to do. Matthew Kellett: The reason why the shoe is dropping more slowly than it might do, if I can be slightly controversial, is that we, as private practice lawyers, are conditioned to working in a certain way. The fact of the matter is we organise ourselves pretty much like we did in 1920 or 1950. Karl Chapman: Riverview Law would not exist if the legal market was effective and efficient in terms of service delivery. What we are doing, effectively, is helping the in-house team to free itself to do the higher value-added stuff. What is happening is you are going to start seeing a lot of the work that is done by external law firms displaced by the internal function going further up the value curve internally, as people like us come in. If I look at why people renew contracts with us, no one ever asks us whether we can do the law. We are a regulated law firm – of course we can. It is all about the data, the analytics and the business insight: how do we pre-empt their future risks and reduce their future costs? How do we add value to their business? Rosemary Martin: For me, the perfect in-house lawyer is one who thinks like somebody from Slaughter and May or Clifford Chance, but who has a business-efficiency mindset of Riverview. The other point is that people have to be cheaper than my in-house team. That is one of the big problems for the external law firms and the Riverviews. It is usually cheaper to just add people yourself. Nick Buckworth: For us costs are manageable to a certain extent, but if all we are going to do is just drive technology, cost and efficiency, without looking at the business we are trying to get, I do not think we would be going in the right direction. We also need to focus very carefully on specialisation and that consistency right across the platform, and offer something genuinely valuable. Sir Nigel Knowles: We should spend more time talking to our clients about what they want to receive rather than trying to work it out for ourselves and then hoping that they like it. The dialogue between law firm and client is weak. Tracey Groves: My work is around management of reputational risk, ethics and compliance and trust, as a strategic adviser to corporates. The relationship I have with my client tends to be one that is more transformational: ‘What can I do that can add impact? What can I do that is strategically going to progress the client further on their journey?’ What I observe happening between some law firms and the client is more transactional in nature. It is one that is required to deliver a set product for a particular issue or problem on which they require legal expertise, and then it stops. My concern for these law firms is: what are you doing to elevate yourself to be able to enter the same debate and dialogue that I am having with the client? Jeffery Barratt: One of the difficulties of law firm structure is that so much is focused on chargeable hours and billings, so spending time on thought leadership is a luxury that many firms feel they cannot afford. Nick Buckworth: I would disagree with that because, if the strategy is to build deep, long-term relationships with a core group of clients, that is where we have to start today. Certainly, the most important thing for us in business is getting our partners to understand that and believe that they will be rewarded for doing that. That is the challenge but, if we are not driving that agenda, we have a real problem. Louise Ruppel: As a client, I completely agree that law firms think they know what they want to give to clients, but they do not take the time to listen to what the client wants and really is looking for, and to build those long-term relationships and understand the business. The ones that will survive, whatever changes are going on, are the ones who have formed those long-lasting relationships and listen. Charles Martin: The role of this one-fifth of the profession that is in-house, which is now, effectively, doing the triage on all of this, determining how much is done in-house and how much is done in a low-cost, commoditised way, and whether they want to see this consolidation or whether increased differentiation and more colours on the palette are what they want to see. I suspect there are different answers for different types of client organisation, but that, to me, alongside IT, is the biggest change. David Isenegger: We hear about your desire to innovate and to get closer to us. In the last five years, what do you think has changed that makes us feel differently about you? We have been talking about alternative billing structures for a long time but it has not come through. Your ability to bring all of the resources that we need to solve legal problems is not fantastic. There is a belief – and certainly I believe – that your innovation has been used to maintain margins and not to reduce our costs. The cost of an M&A transaction in real terms is probably not any different than it was a decade ago. It might be slightly more expensive, in fact, to do one now. Andrew Garard: Fundamentally, the private practice profession is built on exploiting inefficiencies, because it is the only profession that really judges itself by how long it takes to do something. Where I do not agree is that it is difficult to partner with clients, because all I want is my advisers to make me look good. I want my CEO to think I choose the right people: they are commercial, they are business-focused. Karl Chapman: The thing that shocked me is that, if lawyers think you have been in a competitive marketplace, you are joking. You have not been subjected to the same competitive pressures that every other sector in the economy, apart from the public sector, has been subjected to. Stephen Williams: The accountancy profession is now getting busy again. Do we think the circumstances are more propitious for success if they do that than they were ten years ago? Louise Ruppel: I do not think so. They have different relationships with clients. They think differently. You asked whether we need fewer lawyers; I think we need more lawyers with different sets of skills and who really understand what business is all about and what clients’ priorities are. What the accountants have is longstanding, deep-seated relationships with clients. They have process-management skills. They have invested in technology in a way that law firms just do not, over a longer period, and they are prepared to take those longer-term decisions. The traditional law-firm model, however, is looking to the next profits per partner next year. It is not necessarily compatible with taking a long-term view. Charles Martin: I am sure that the key to success in this market, whether you are an accountant, Riverview or Magic Circle, is doing what you say you do on the tin. It has to be something that clients want, delivering what you say you are going to deliver and doing it really well, at the right price. If you are premium service, by all means charge a premium price, but deliver it. If you are not at that price point, do it well and acceptably for that price point. From the perspective of law firms listening to all of this, the big challenge is to synthesise that and to keep your entire firm energised by this challenge, not depressed by it – because lawyers naturally do not like change – and to get an organisation behind the change necessary to meet this challenge.